Like many manufacturers, MSI has announced its motherboards on the Intel X48 chipset prior to the official announcement of the latter. In fact, motherboard manufacturers should not be blamed: the chipset was ready for the mass market long ago (MSI had enough time with test samples), but for a number of marketing reasons Intel delayed the rollout of the chipset (almost since early January). However, when this article was ready, Intel already published information about this chipset on its web site. In this situation, the review of a motherboard should be preceded by a description of the X48 chipset. Fortunately, it won't be a long story. The new product differs from the top Intel X38 (launched last summer) only in the lack of DDR2 support and 1600MHz FSB/memory clock rate. Similar changes will be made to all desktop chipsets from Intel, the series will be renamed from 3x to 4x. However, Mid-End chipsets will be rolled out only this summer. So if you want a computer with a 1600 MHz FSB (DDR3-1600 is not of current importance), Intel is ready to offer such a solution. Motherboard manufacturers also offer an alternative—bus-overclocked products on the P35 (we'll review such a motherboard from Biostar in the future). What concerns chipsets, NVIDIA is going to present the updated nForce 790i (it will also be reviewed in the nearest future). By the way, one of the arguments for using older chipsets is their support for DDR2 memory. 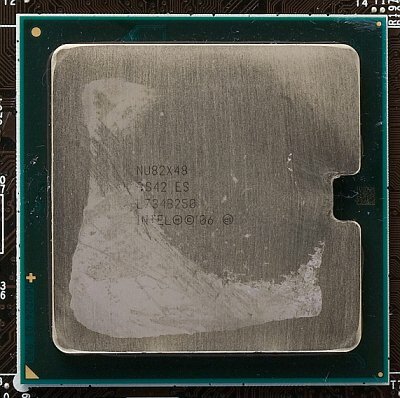 Indeed, many computer enthusiasts, who plan an upgrade with the launch of faster processors, are not willing to change their expensive memory kits for overclockers. Common users will certainly prefer DDR2 memory as well, if they have a look at prices. That's the explanation for the current situation, typical of transition periods, when even top motherboards on new chipsets support an old memory type, even though enthusiasts shouldn't be scared away by high prices. 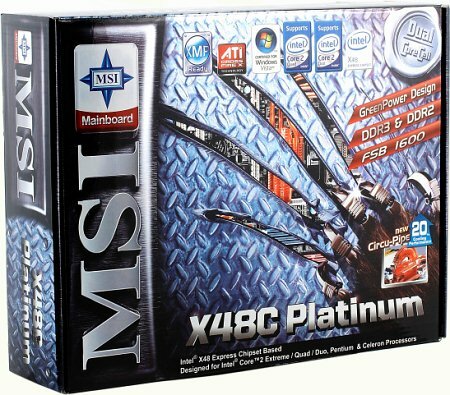 In this case, however, MSI uses a rarer option: the X48C Platinum motherboard contains slots for both types of memory (that's a relatively usual situation for a transition period, when such a technology is supported by a chipset) and a circuit to switch between the operating modes of the chipset memory controller. Unfortunately, it's not a very good solution, because a user has to install two stubs into memory slots of the unused type. These cards can be flipped to fit a slot type. To make up for the bulky solution, these stubs are equipped with LEDs that indicate the current memory type and help diagnose startup problems (if they don't light up, you have a problem). Except for the area of memory modules, the motherboard looks quite ordinary: the first thing that attracts attention is the heatpiped chipset cooling system. We've already seen a similar solution in P35 Platinum (by the way, this implementation of Circu-Pipe is much smaller and has fewer heat sinks, although the chipset is a tad hotter because of the higher FSB clock rate). Only the second glance reveals a little discrepancy: the cooling system is designed for three chipset bridges (or other hot chips). It's a strange situation, because the motherboard does not have additional elements that require such cooling according to its specifications. They are installed (one component only) in the more expensive MSI X48 Platinum. The mysterious third chip is a PCI Express expander (it's a bridge that routes peripheral PCI-E lanes of the Southbridge to two additional PCIEx16 slots for a quad-card graphics system). There wouldn't have been anything strange in this fact (manufacturers often design common PCB layouts for similar motherboards—but the fact is, X48 Platinum significantly differs from X48C Platinum in PCB design (in particular, the top model supports only DDR3 and has four slots for such memory). Well, in our case the third heat sink expectedly covers empty PCB. Judging by photos on the MSI web site, PCB layout of the retail product will remain the same (however, the third heat sink and its heat pipe will be removed). Having examined all strange elements of the motherboard, let's return to the "normal" issues. The above mentioned solutions leave almost no free room on the PCB. Moreover, there have appeared some problems with the layout of elements: for example, it's difficult to open/close latches on memory slots after a graphics card is installed. On the other hand, all HDD connectors lie on their sides, so even the longest expansion card won't block them. Another advantage of this PCB layout for many users is three PCI slots accessible even if you install a very thick graphics card. According to the documentation, the motherboard should be equipped with power and reset buttons (they were not installed in our sample), which may be a nice addon for some users. The motherboard uses an unusual switching voltage regulator for a CPU: it uses two independent 4-phase PWM controllers (two field-effect transistors per phase), which should theoretically be better than an 8-phase controller used in many top motherboards. The motherboard uses only polymer capacitors (not only in CPU power circuits, everywhere), Low ESR, made in Japan. There are many of them in the CPU power circuit (12 x 820 uF for 2.5 V and 3 x 470 uF for 16 V—they are all made by Sanyo). Much attention is paid to the memory power system: it uses several chokes and Sanyo capacitors. Besides, MSI uses ferrite chokes instead of iron chokes, so they consume less power and remain cooler. By the way, the cooling system of the chipset does a great job, so heat sinks on chipset bridges are barely warm. Motherboard dimensions—305x245 mm (full-size ATX), nine-screw mount, all edges of the motherboard are fixed. Automatic CPU fan speed control depending on temperature: you can specify target temperature for a CPU (40-70B°C) and fan speed (at 12.5% steps) for lower temperatures. Besides, the motherboard allows to control rotational speed of one system fan directly (unlike the popular automatic control): you can set the speed at 25% steps. 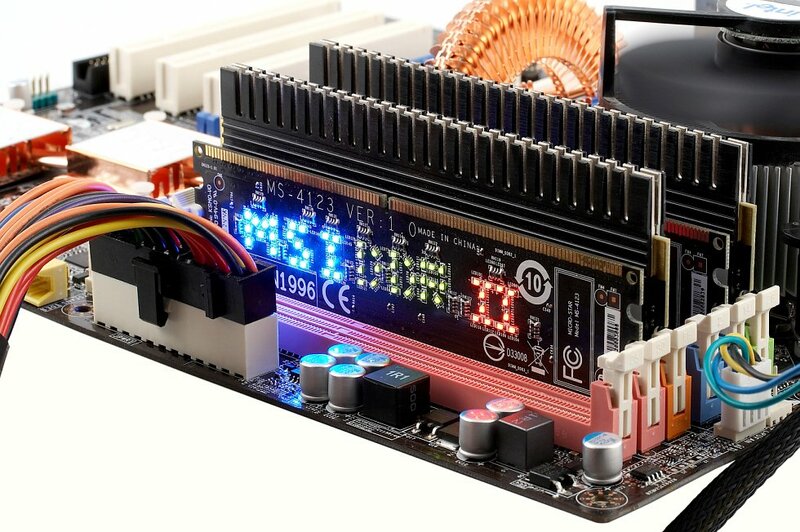 The monitoring section of BIOS Setup shows efficiency factor of the switching voltage regulator (power at the input of the PWM controller and at the output) in order to evaluate efficiency of the CPU power circuitry. This is a useless option for BIOS Setup, where the CPU load is close to zero. But monitoring this parameter during real tasks using MSI Dual Core Center may provide interesting information. Unfortunately, Dual Core Center failed to work with this motherboard—probably a newer version of this utility is required. This program usually offers rich options for overclocking and monitoring, including control over rotational speed of system fans. Six(!) fan headers (3 of them offer rpm control), 4-pin header for a CPU fan allows automatic rpm control, one of the others—forced fan speed control. 6 x analog audio jacks: Line-In, Front, Mic-In, Rear, Center/Sub, Side. This rear panel also places four USB ports in a separate group. It looks unusual, but it's very convenient: you will hardly find two devices with conflicting USBs, when they are plugged to the motherboard, including USB sticks of the most exotic shapes. Besides, MSI engineers borrowed a very good idea from Shuttle: you can now reset CMOS even without opening your PC case, which is, of course, much more convenient than even a button on the motherboard. CDs with necessary drivers (for Windows XP and Vista) and utilities, including Dual Core Center, DOT Express (to monitor system parameters, control fan speed, overclock the system, etc), and Live Update (to download and update drivers, utilities, and BIOS versions via Internet). General performance: Very good. This motherboard uses a high quality but simple 10-channel audio codec ALC888, which does not possess additional functions to interest home users (for example, DTS or real-time AC-3 encoding to output audio to S/PDIF). In return, analog audio output is on a very good level, being one of the best representatives of the integrated audio. 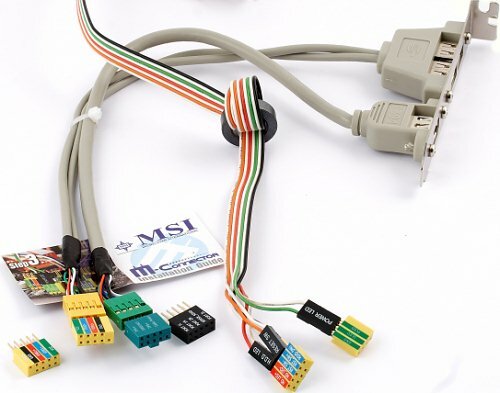 The motherboard uses Marvell 88SE6111 IDE controller, employed in the latest MSI products, so you don't have to worry about support for hard drives with the old interface: from our experience we know that this solution allows to boot up from CD, install an operating system from CD/DVD, it does not require to update specific managers to work with disc images and drivers in Windows XP—that is it's practically an ideal solution for owners of IDE devices. But reality was crudely different. In this very case the motherboard failed to boot up from a CD drive with the IDE interface. Moreover, when we plugged a DVD drive to the interface without connecting a power cable, it froze the system at the stage of device initialization (it may bring inexperienced users to stupor.) It's hard to determine the reason of such differences in Marvell 88SE6111 operations in different motherboards; we can only hope that BIOS updates will fix the problem. We used BIOS 7.0b6 dated 03.03.08, the latest available BIOS version at the time of our tests. The mentioned BIOS parameters are available in this version, but the viability of non-standard settings hasn't been tested. Your BIOS settings can be saved into two profiles, which can be restored from BIOS Setup (it's a useful feature for overclocking experiments). Flashing the latest BIOS version was not very easy: the fact is, MSI does not publish new BIOS versions on its web site to be downloaded via http. Instead, a user has to use MSI utilities, which automatically download necessary updates from the web site. It's difficult to take into account all pros and cons of this approach (perhaps, it has more pros than cons), but it's certainly an unusual situation. You can also change six voltages: CPU GTL Reference Voltage 1, CPU GTL Reference Voltage 2, MCH GTL Reference Voltage, DDR CHA Reference Voltage, DDR CHB Reference Voltage, MCH DDR Reference Voltage. We haven't tested memory modules with XMP so far, even though the X48 chipset was the first to offer such support. Theoretically, the situation should be similar to that with EPP: BIOS Setup will allow to choose one of performance profiles and adjust its parameters, when necessary. From all chipsets we've seen so far, only the Intel 3x series supports DDR3. So it was easy to find a competitor to MSI X48C Platinum: a motherboard from the same manufacturer (also supporting both memory types) based on P35—P35 Neo Combo. This is a modern motherboard with average functionality (among representatives of all chipsets): there are no performance leaders now at all. There may be only an insignificant performance difference between the motherboards. However, it should be noted that DDR3 support was added to P35 Neo Combo artificially (at least at the time of these tests and with the above-mentioned BIOS version): there were no normal memory timings and voltages typical of DDR3. X48C Platinum looks great versus its competitor: it offers a full set of timings for both memory types, including Command Rate (1T/2T). 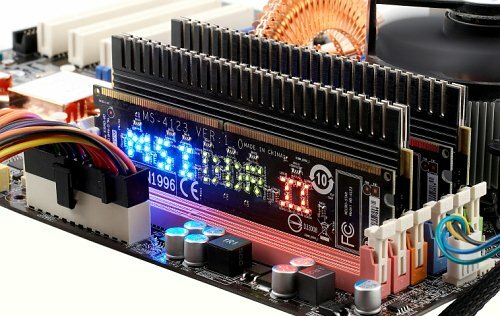 Besides it can boast of a cunning algorithm for supplying memory voltage—it recalculates the last voltage specified in BIOS Setup for the current memory type. So if you upgraded your memory from DDR2 to DDR3, there is no need to change anything in BIOS—the motherboard will automatically change 1.8 V to 1.5 V. If the system was configured for higher (by 25%) DDR2 voltage (2.25 V is too high for DDR3, it may damage memory modules), and then you upgraded to DDR3, the voltage level will be adjusted proportionally to a relatively safe value—1.5 V + 25% (1.88 V). 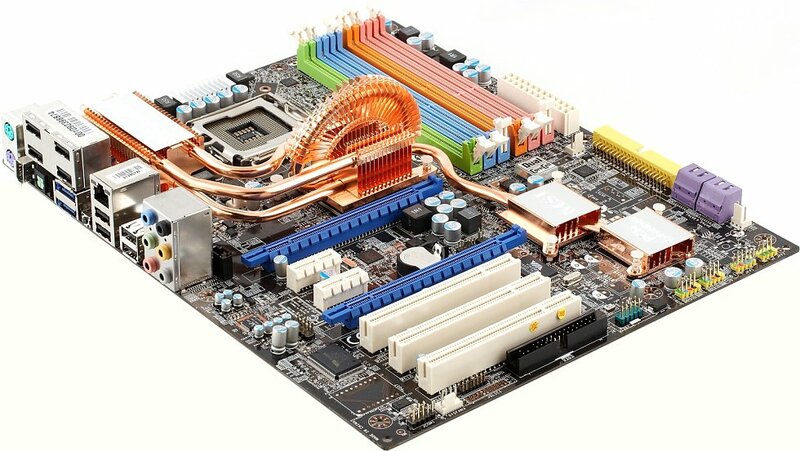 Besides, the new motherboard allows to use DDR3 modules in their native modes. So, for example, DDR3-1066@6-6-6-1T demonstrates a little advantage of the MSI X48C Platinum over the MSI P35 Neo Combo, which cannot use this mode. 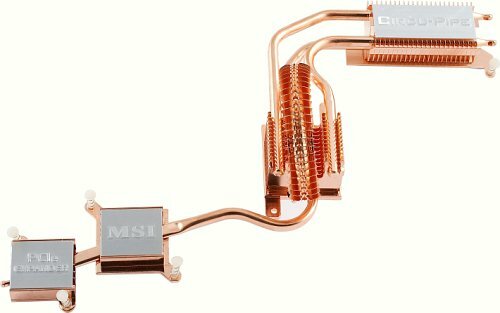 This MSI motherboard differs from the existing and announced products on Intel X48 in two aspects: chipset cooling system (Circu-Pipe) and support for two memory types. Any top model (manufacturers will hardly offer other products on X48) will try to distinguish itself in shape and number of heat pipes in its cooling system, of course. But we can be sure that we like this MSI product and the functions it offers. Besides, it solved almost all problems with its dimensions. 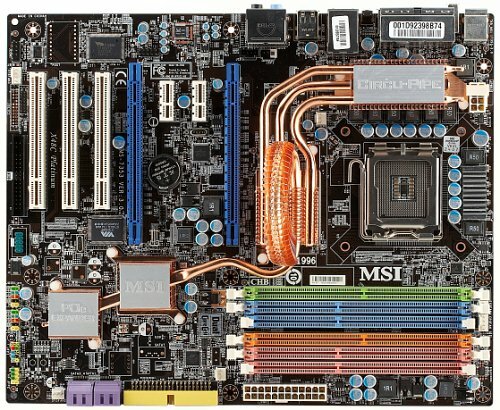 Support for two memory types is a rare feature for this class of motherboards, so MSI X48C Platinum definitely stands out here. Time will show whether users need this solution. We can only say that the product implements this hybrid technology on a good level. Our Original Design award is well deserved. 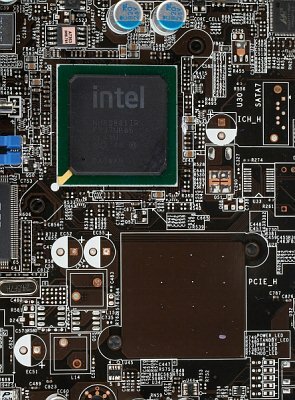 On the whole, X48-based motherboards won't have a serious impact on the market: only memory manufacturers dream about upgrading to DDR3 now, processors with the 1333 MHz FSB will work fine in motherboards based on Intel 3x chipsets, while processors with the 1600 MHz FSB will be represented only by top extreme solutions until the summer announcement of Intel 4x chipsets. 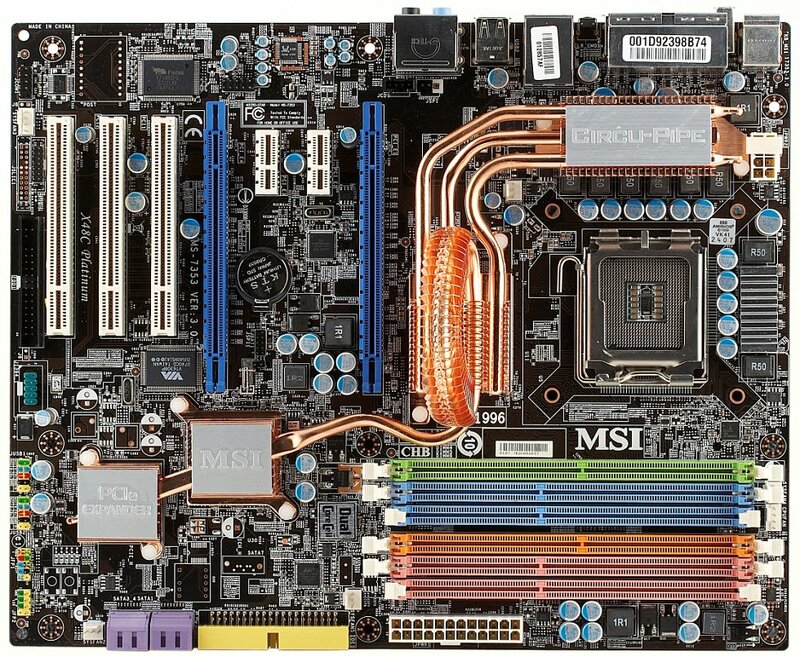 Nevertheless, this very motherboard is a good choice: it cannot replace P35/G33-based products only because it's more expensive, but it can outscore X38 products.